In our modern and mobile society, the range of answers to the questions �What am I supposed to do with my life?� and �How do I know when I�ve found my purpose?� can seem endless and overwhelming. �Follow your bliss,� wrote Joseph Campbell. And who doesn�t desire that. But how is it possible �to follow your bliss� when there are children to care for and bills to pay and retirement plans to make. 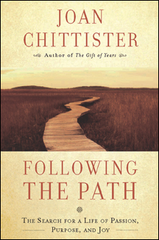 In Following the Path, Joan Chittister helps us to follow our deepest call, to find the place where, finally, we know we fit, where we are the fullest of ourselves and a gift to the world. This is a timely and much needed message that many will be happy to hear. What does enjoyment have to do with happiness? What does it mean �to have a purpose�? How do I know I�m doing what I�m meant to do? Is it ever too late to start over? This book is about what it takes to find and respond to the magnet within us�that great, deep passion for life toward which our hearts leap up at every turn. This is the call that demands that we give back to life everything that life has given to us. Then, at some moment far from now, perhaps, the feeling will finally come that, looking back, whatever difficulties we have suffered in its doing, it has all been right. The question of what each of us is meant to do in life is the question that no one else can answer for us. It is the question of uniqueness. It is the moral imperative of every human life. To discover and pursue what we are called to do in life is the very fundament of happiness. There is no doubt that a lot of what happens to us in life seems to be happenstance, out of our control, determinative. And it is. It always has been. Who knows when it happened? Most of us don�t even know who did it. But one thing we can be sure of: if we�re where we are today�maybe even who we are today�it�s because someone somewhere�a great grandparent, a grandparent, a parent, found themselves at a turn in the road�and took it. We will find our way through life one fall at a time, one stone wall at a time, one blind spot at a time, one misunderstanding at a time, one fear at a time. One more bit of arrogance toppled, one more bit of self doubt confirmed, at a time. Which means that determining what we are meant to do with our lives will necessarily unfold slowly and tentatively. Just as we grow slowly and tentatively, so will our understanding and awareness of what we are meant to do in life develop the same way. I just completed reading for the first time, (I anticipate re-reading it.) the book Following the Path. It was and is profoundly helpful to me as I am in a time of unanticipated change in terms of vocation�discerning new expressions of call, and life. Thank you for putting into words and into print the unarticulated longings and unspoken prayers of many who are looking for deeper meaning, connection, purpose and passion. �C.D.